Fashionistas put their names on long lists for the latest "it" handbag of the season. Travelistas search for the "go-to" destinations, ones that hopefully will run the course of more than just a season. My latest travel destination, however, is the vortex of both worlds--the fashionista-glamorous set and the adventurous-bohemian crowd. But get ready to fly long distances and drive through rough, dirt roads, pass by papaya and banana plantations and buffalos grazing in wide green fields to get to Trancoso. Part of the charm of this most eccentric yet beautiful colonial town on the NE coast of Brazil is precisely because it is hard to get to. Trancoso was most famous in the 70's and 80's as a "hippie drop-out mecca" where the Rolling Stones and other famous groups came here for secluded fun. It is hard to believe, but until the late 70's the natives in this area were not even familiar with the Brazilian national currency and bartered their goods with one another. And yes, there wasn't electricity in many of the nearby towns up until a few years ago. But now, imagine the quiet glamour of St. Tropez or St. Barth's in the '70's, before the descent of mega-yachts and designer label boutiques. "Oh, Trancoso is where the rich come to pretend to be poor," our driver says with a chuckle. "This time of the year, it is crazy. Many supermodels. Many families from Sao Paulo. Tomorrow, I will be hired for a week as a driver for a French family who is coming with a private jet, and has many guards. It is crazy here." We were travelling in what seemed to be a pockmarked torture course for half an hour. Obviously the cars here need to have major shock absorbers or are in no need of mufflers. I turned to the driver and asked in disbelief, "You mean all these people you are telling me about drive through these roads to get to their beachfront villas and hotels?" "Oh no," he said with a you-must-be-so-naive smile, "They go by helicopter. It only takes them ten minutes to get to the beach. " And he was definitely right. For the next few days we heard the steady hum of helicopters up above, zipping up and down the coastline. South Bahia, where Trancoso is located, is known as the Discovery Coast. It has miles and miles of virgin beaches with powdery sand and coconut palms. And my teenage sons would both agree that they did discover many things by the beach, most notably, gorgeous people in very skimpy, floss bikinis. The Relais & Chateaux Resort, Pousada Estrela d' Agua has the best bar and restaurant on the beach with lots of people watching. 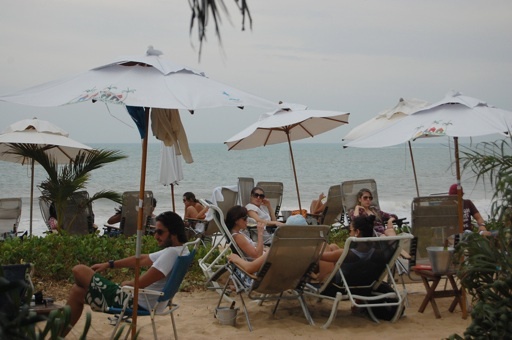 Just a five minute walk down the beach takes you to Toxtex, which would be most comparable to the "Nicky Beach" of Trancoso--a lounge style beach, with a DJ, and lots of people spilling out into the beach. At nights, there is plenty of dancing to electronic music in this venue as well. But there is a definite lack of pretension in all things--from the villas and restaurants to the people themselves. No big hotels, just pousadas in shape of converted village houses with tiled or thatched roofs. No high heels or long pants. Flip flops, summer dresses, and shorts. No magnum bottles of champagne and sparklers, but plenty of caipirinhas, which is Brazil's better version of a mojito. But other than that, prices for food and stay are comparable to that of South of France. Praia Espelho, (translated means Mirror Beach) is considered one of the most beautiful beaches in Brazil--turquoise waters, with rivers snaking through the beaches and merging into the ocean. We spent $75.00 on a side order of Bahian rice and beans in an unassuming restaurant in Espelho. 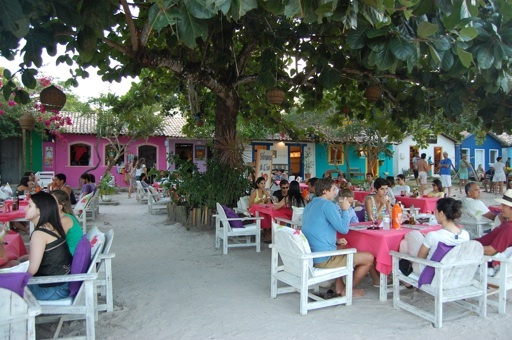 In this very beach, there is the famed restaurant-shack, Sylvinha's. There is no menu--just the fresh catch of the day, prepared in a fusion of spices and served on balcony of the house that overlooks the water on one side and the kitchen's wood burning stove on the other. Of course coconut juice is served the traditional way, the top of a chilled coconut is sliced off with a machete and a straw inserted for convenience. But such exquisitely simple and beautiful experiences make it all worth while. Most people saunter into the town's historic center, called the Quadrado, in the late evening for shopping and fabulous dinners. (Shops are open from 4pm til midnight). And yes, even those with the rustic, multimillion dollar villas have to go through the dirt roads and pass a bridge of two-by-four wood planks. The Quadrado is arguably the most magical beachside village I have ever been to. At one end is Igreja de Sao Joao Batista, the 2nd oldest church in Brazil built by Portuguese settlers in 1586. All along the square are one-story artisan houses, made from mud and clay with plank doors and palm fond roofs, each painted in different colors-- lime green, cannary yellow, day-glo orange, lavender, and blue. These houses serve as boutiques, restaurants, and bars. Visitors dine on picnic tables on the grass underneath hundred year-old mango and jackfruit trees by flickering candle light, which makes for a fairy tale scene. Hands down, we had the best pizza outside of Italy at the Maritaka restaurant in the Quadrado. In our week long stay, at Villas of Trancoso, just a few yards away from Estrela d' Agua, the friendly staff arranged for us to play at the Terrravista golf course, considered the best in Brazil. We also kayaked in the nearby rivers that were filled with lili pads and mangrove trees and went on a 24 km mountain bike ride, although after the 12 km, we were tired already but didn't have a choice but to bike the next hour back. At least cold coconut juice in hacked off coconuts were awaiting us at the end of our adventurous expedition. We even sat in on a local capoera class. This unique Brazilian form of martial arts, is accompanied by chanting, drumming, and lots of acrobatics, and what do you know--monkey sounds. We all found the class fascinating. Our week was topped off by the New Year's Eve celebrations that traditionally takes place by the beach. Hundreds of people dressed in white come to beach, light candles on the sand, and walk into the water to offer white roses to Iemanja--the Godess of the Sea-- who grants good fortune and blessings. There is also the ceremonial jumping over the waves 7 times for good luck for the new year. We all took part in this ceremony and watched the fireworks in the moonlit sky and danced on the beach. I couldn't think of a better way of bringing in the new year--in a place that is beautiful and glamorous without trying too hard.